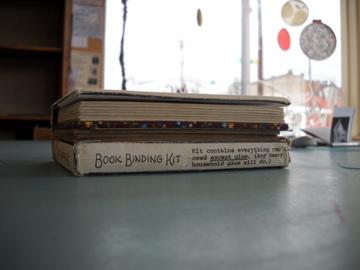 Last night I taught the fourth and last night of my first Bookbinding for Artists class. I had a great time brainstorming with my pupils (each of them was a star) and sharing my love of all things book-related. A few neat things happened. Julie surprised me with a little gift that came through Downtown Books and News recently (I love hearing about all of the random and interesting books that end up there). 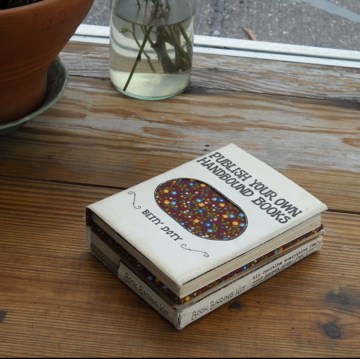 From what I can gather, this little book was made completely by hand, and it looks like the pages are photocopied. I love to see such DIY masterpieces. 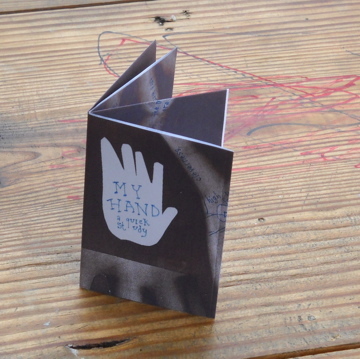 (in case you can’t read the cover, it’s titled “My Hand: A Quick Study”. This type of book is made from one sheet of 8.5×11 paper. Instructions here. In short, I had a lovely time teaching my first class at the shop. I’m planning to add a few more in the coming months. Check the Dry Goods Shop blog for our calendar to see what’s coming up!